The rapid emergence of large pueblos during the fourteenth century CE was a critical change in the cultural history of New Mexico’s northern Rio Grande valley. To investigate this development and its ramifications, in the early 1970s Douglas Schwartz chose Arroyo Hondo Pueblo as the focus of a major archeological project. Three main considerations formed the framework of the research: (1) the nature of northern Rio Grande Pueblo culture in the large fourteenth-century towns; (2) the factors leading to the origin, growth and change of these pueblos; and (3) the use of Arroyo Hondo Pueblo, along with comparative ethnographic material, in examining the cross-cultural implications of the relationship. Arroyo Hondo Pueblo, located about 5 miles south of present-day Santa Fe, New Mexico, contained at its peak approximately one thousand rooms. Test excavations carried out at the site in July 1970 were followed by full-scale excavations during the summers from 1971 through 1974, in addition to ecological and archeological surveys of the surrounding area. The National Science Foundation, the National Geographic Society, and the School of American Research supported this work. During the course of the project it became clear that the extent of archeological material recovered and the complexity of the ideas that emerged called for publication of more than a single volume. Each specialized topic was assigned to one or two individuals who compiled and analyzed the data, in many cases beginning with the fieldwork stage, and who wrote the monograph on that topic. Doug Schwartz served as the series editor. The resulting series of nine volumes followed three earlier published “Field Reports,” and presented information and ideas on specific topics. 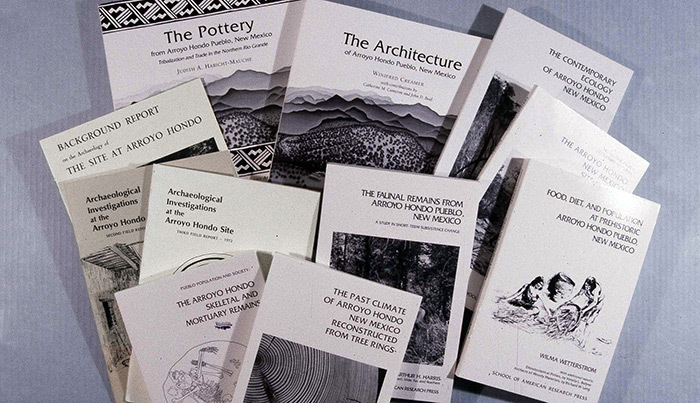 Although each volume focused on the comprehensive presentation of descriptive data or an analysis of a particular set of data, it was also intended that each stand independently as a contribution to Arroyo Hondo and northern Rio Grande archaeology.